“Domestic Water Wells in Arizona, A Guide for Realtors and Mortgage Lenders” an e-book available through Amazon and Barnes & Noble Sept 27, 2016. Designated McEllhiney Distinguished Lecturer for 2019, giving talks throughout the US. Continuing a tradition promoted by the Groundwater Foundation and the National Ground Water Association. “Adapting to the Changing Nature of Water Well Drilling Markets”, Guest Editorial WWJ. a publication of the National Groundwater Association, February 2018. “Drilling Disasters and What We Learned From Them”, a Continuing Education presentation for the New Mexico Ground Water Association, Albuquerque, NM, January 2016 & 2018. “Well, What Do We Know” a series of workshops for private well owners conducted with J. Artiola, Ph.D. and Ms. Kristine Uhlman, of the University of Arizona Co-Operative Extension. Starting in Dec 2009, in Young, AZ and continuing through Safford, AZ in October 2018. “Private Water Well and Residential Properties”, a 3 Hour Continuing Education course for Real Estate Agents & Appraisers taught at the Hogan School of Real Estate, Tucson from 2006 to 2018, and also taught at the Scottsdale School of Real Estate and Business from 2014 to Dec 2017. “Water Well System Inspections” a Brown Bag webinar presented for the National Ground Water Association October 25, 2017. “What Test Determines if Well Water if Potable?” Article published in Hogan School or Real Estate newsletter The Front Runner, May-June 2017. “What’s in Your Well Share Agreement?” Article published in Hogan School or Real Estate newsletter The Front Runner, September-October 2017. “Drilling in Extreme Heat” Article published in Water Well Journal June 2017. “Drought and Your Water Well” a Brown Bag webinar presentation for the National Ground Water Association July 23, 2017. “Arizona Well Owner’s Guide to Water Supply, 2nd. Ed. A publication of the U of A Co-Op Extension. Bulletin1485. by J. Artiola, K. Uhlman, G. Hix. June 2017. “Due to Drought, Farming, Irrigation and Groundwater Wells Are Forever Linked” Irrigation Today, a publication of the Irrigation Association, April 2017. 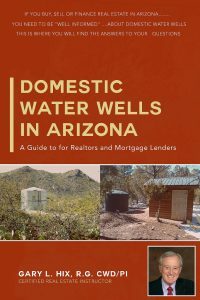 “Domestic Water Wells in Arizona, A Guide for Realtors and Mortgage Lenders” an e-book available through Amazon and Barnes & Noble published Sept 27, 2016. “Water Well Drilling Methods”, a workshop for Bureau of Land Management employees, Las Vegas, NV. and Phoenix, AZ. June 2018, Dec 2014, May 2010, Aug 2008, May 2006, May 2004, and May 2002. “Drilling In Extremely Hot Weather” Article in NGWA Newsletter, a publication of the National Groundwater Association, July 5, 2016. “What All Arizonans Should Know About Private Water Wells” a presentation at the Appleton-Whittell Research Ranch, Elgin, AZ, March 12, 2016. “Ethical Issues Surrounding Well Inspections” article published in the June 2015 issue of the Water Well Journal, a publication of the National Groundwater Association. Followed by a workshop given at the December NGWA Expo and Conference, Las Vegas, NV. Dec 16, 2015. “If a Well Goes Dry Shortly After Closing, Can the Buyer Sue the Realtor?”Article published in Hogan School or Real Estate newsletter The Front Runner, March-April 2017. “Warning to Realtors and Mortgage Lenders, Shared Water Wells Carry No Warranty of a Future Water Supply” Article published in Hogan School or Real Estate newsletter The Front Runner, November – December 2016. “Show Me The Well Facts” Article published in Hogan School or Real Estate newsletter The Front Runner, March-April 2016. “What Does It Mean to Certify? Article published in Hogan School or Real Estate newsletter Front Runner, July-August 2015. “An Arizona Guide to Domestic Well Registration and Record-keeping” Co authored with J. Artiola, Ph D., University of Arizona Cooperative Extension Bulletin AZ1663, May, 2015. “Straight Well Require Straight Drilling Methods”, article published in Arizona Water Well Association newsletter Well Said, Fall 2014 and as “On Target” in the Water Well Journal, a publication of the National Ground Water Association. March 2015. “Oh Well When It Comes To Water Quality” article published in Arizona School of Real Estate and Business’s Arizona Journal newsletter, Vol. 29, No.8. April, 2014. “Shouldn’t We Be More Concerned About the Quality of Our Customer’s Water”? article published in the Arizona Water Well Association newsletter Well Said, July, 2014. “An Arizona Guide to Water Quality and Uses” Co authored with J. Artiola, Ph.D., C. Gerba, Ph.D., and James Riley Ph.D., University of Arizona Cooperative Extension Bulletin AZ1610, January, 2014. “What Well Owners Should Know About Shock Chlorination” Co authored with J. Artiola, Ph.D., C. Gerba, Ph.D., and K. Farrell-Poe, Ph.D., University of Arizona Cooperative Extension Bulletin AZ1605, September, 2013. “Latest Research on Bacteria May Benefit Water Well Owners” a paper and presentation made at the Arizona Hydrological Society 26th. Annual Symposium, Tucson, Az. September 2013. Arizona Well Owners Video Series, Narration and appearance in four Youtube videos produced with Dr. Janick Artiola Ph.D., released through the University of Arizona Cooperative Extension as Bulletin AZ1595, July 2013. “Well Inspection Contracts” Article Published in the Water Well Journal, A publication of the National Ground Water Association. Vol. 67, No 4. April 2013. “Water Storage Tank Disinfection, Testing and Maintenance”, Co authored with J. Artiola Ph.D., and C. Rock Ph.D., University of Arizona Cooperative Extension Bulletin AZ1586. November 2012. “Arizona Wells: Maintaining and Troubleshooting Wells” Co authored with J. Artiola Ph.D. and K. Uhlman, R.G. University of Arizona Cooperative Extension Bulletin AZ1581, August 2012. “Connecting With Private Well Owners” A paper and presentation at 2012 Land Grant and Sea Grant National Water Conference, Portland, OR. May 20, 2012. “Ground Source Heat Pumps, Come and Get Them” Article published in Arizona Water Well Association newsletter Well Said, Spring 2012. “10 Things REALTORS® Should Know About Private Water Wells”, Article published in the Arizona Realtors Magazine, November 2011. “Tailoring Your Motivational Techniques to Your Employee Needs Today” a presentation at the Rural Water Association 20th. Annual Leadership Conference. Chandler, AZ. September 15, 2011. “Drilling High Capacity Wells, Southwestern Style”, an Internet Webinar conducted for the National Ground Water Association’s High Capacity Pumps and Wells Interest Group on August 27, 2010. “The Future of Private Water Wells in Arizona” a Power Point presentation given for the Pima Association of Governments Watershed Planning Committee. Tucson, Az. April 26, 2010. 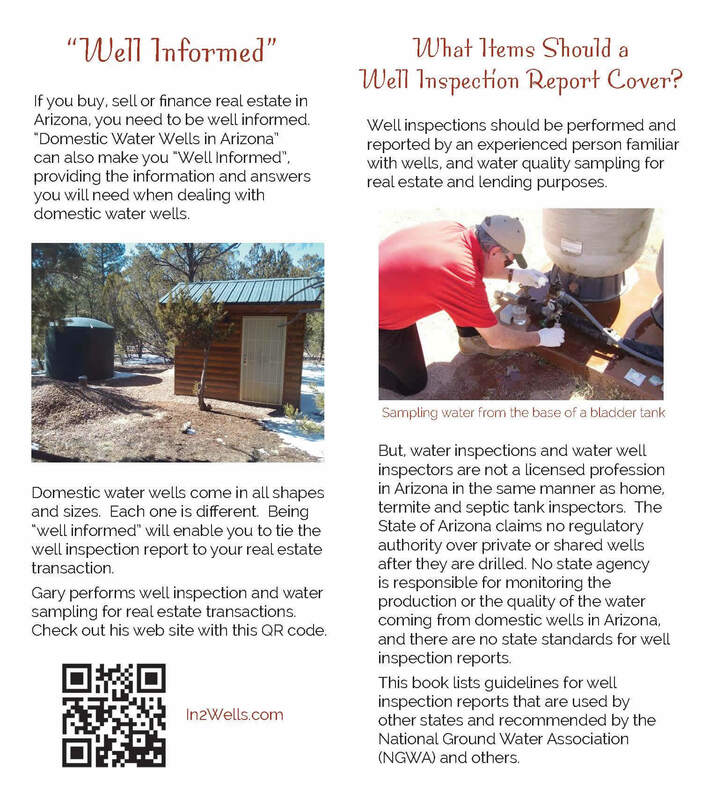 “Well Drillers: Do You Inspect Private Water Well Systems?” article published in the Well Said newsletter of the Arizona Water Well Association, Fall 2009. “A Call for Changes, or Let’s Get This Fixed!” an article published in the Frontrunner, a publication of the Hogan School of Real Estate, Nov/Dec 2009. “Teaching New Employees How to Diagnose Water Well & Pump Problems Over the Phone.” A presentation at Mountain States Ground Water Exposition, Laughlin, NV. February 12, 2009. “I Can See Clearly Now” An article published in the Well Said, A quarterly publication of the Arizona Water Well Association, Winter 2008. “How to Maintain a Profit Margin in these Difficult Times, Illustrations and Ideas”. An oral presentation at the Arizona Water Well Association Quarterly Meeting, April 12, 2008. “Workmanship Standards for Domestic Water Wells, Are We All On The Same Page”? A presentation for the Mountain States Ground Water Exposition. Laughlin, NV. February 14, 2008. “What is a Certified Flow Test?” Frontrunner, A publication of Hogan School or Real Estate, Nov/Dec 2007. “Water Quantity & Quality Issues During Residential House Sales With a Private Water Well,” Frontrunner, A publication of Hogan School or Real Estate, Jan/Feb 2007. “Licensing of Water Well Pump Installers, The Time has Come”. Editorial in the Well Said, a Publication of the Arizona Water Well Association, Spring 2007. “Be Aware Water Well Drillers and Pump Installers, The ROC May Come After You, Too!”, Editorial in the Well Said, a Publication of the Arizona Water Well Association, Summer 2007. “Economics of Well Drilling” and “Trouble Shooting Submersible Pumps & Motors”, two workshops (Power Point and hands on) presented at the NGWA Groundwater Expo. Las Vegas, NV. Dec 12-15, 2004. “Using Technology- Adapting Off-the-Shelf Motor Protection and Monitoring Devices”, Pump Users Expo, Baton Rouge, LA. a Power Point presentation. September 15-17, 2004. “Water Well Construction and Maintenance”, Pima Community College, ASETT Center, Tucson, AZ. A two day (multi-media and field trip) course in well construction methods, pump installation and maintenance. August 11-12, 2003, and April 28-29, 2004. “Constant Pressure Systems, First Hand Experiences”, Water Well Journal, A publication of Ground Water Publishing Co. Vol. 57, No 3. March 2000. “Protecting Submersible Motors from Lightning and Other Voltage Spikes” Water Well Journal, Vol. 56, No. 1, a publication of Ground Water Publishing Co. January 1999. “A Well Driller’s Perspective from the Trenches”, Water Conditioning and Purification, A publication of Publicom, Inc. Tucson, Az. December 1998. “How to Survive Changes in the Environmental Market”. Water Well Journal, Vol. 55, No. 12, a publication of Ground Water Publishing Co. March, 1998. “NPDES Permits Required for Water Well Drillers? What Next?” Water Well Journal, Vol. 55, No. 2, a publication of Ground Water Publishing Co. February 1998. “Wells and Water Quality Problems, It’s A Different World Today”, Water Conditioning and Purification, A publication of Publicom, Inc. Tucson, AZ. December 1997. “It’s time for a Change in Written Water Well Specifications: A Contractor’s Perspective”. Water Well Journal, Vol 51. No. 8, a publication of Ground Water Publishing Co. August, 1997. “Protect Your Eyes Now, for Better Use Later On!‘ Water Well Journal, June, 1997. Vol 51. No. 6. A publication of Ground Water Publishing Co.
“New Equipment Allows New Thinking About Equipping Water Systems”, Well Said, April, 1997. 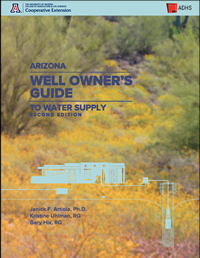 A publication of the Arizona Water Well Association. “You’ll Get a Boost out of the Latest in Pump Technology”. Water Well Journal, May, 1997. Vol 51. No. 5. A publication of Ground Water Publishing Co.
“Maps: Where Would We Be Without Them? Where Are We Going With Them?” Water Well Journal, March, 1997. Vol 51. No. 3. A publication of Ground Water Publishing Co.
“Lump Sum Pricing of Well Drilling and Construction Services”. Water Well Journal, January, 1997. Vol 51. No. 1. A publication of Ground Water Publishing Co.
“Annual Services Contracts: Can They Work For You?” Water Well Journal, October, 1996. Vol 50. No. 10. A publication of Ground Water Publishing Co.
“Well Drillers in Court”. Water Well Journal, June, 1996. Vol 50. No. 6. A publication of Ground Water Publishing Co.
“Wellhead Treatment Methods for Ground Water” Water Well Journal, April, 1996. Vol 50. No. 4. A publication of Ground Water Publishing Co.
“Pre-installation Check of Submersible Motors and Pumps: Logical Procedure or Ritual?” Water Well Journal, December, 1995. Vol 49. No. 12. A publication of Ground Water Publishing Co.
“Service and Repair of Small Submersible Pumps”. Water Well Journal, March, 1996. Vol 50. No. 3. A publication of Ground Water Publishing Co.
“More on the Development of Horizontal Wells”, Water Well Journal, February 1996. Vol 50, No. 2. A publication of Ground Water Publishing Co.
“Land Subsidence and Ground Water Withdrawal”. Water Well Journal, November, 1995. Vol 49. No. 11. A publication of Ground Water Publishing Co.
“The Outcome of A Well: the Contractor’s Responsibility?” Water Well Journal, October, 1995. Vol 49. No. 10. A publication of Ground Water Publishing Co.
“Homemade Rig Drives a Point Home”. Water Well Journal, July, 1995. Vol. 49. No. 7. A publication of Ground Water Publishing Co.
“Practical Advice for Conducting Well and Pump Tests”. Water Well Journal, June, 1995. Vol. 49. No. 6. A publication of Ground Water Publishing Co.
“Innovative Tools and Techniques for Developing Ground Water Monitoring Wells”. An Outdoor Action Workshop, Proceedings of the 9th. Annual Outdoor Action Conference. May, 1995. Las Vegas, NV. “Using Sand Points to Install Ground Water Monitoring Wells”. Water Well Journal, May, 1995. Vol. 49. No. 5. A publication of Ground Water Publishing Co.
“Gone Fishing – in a Monitoring Well”, Water Well Journal, April, 1995, Vol. 49., No. 4., A publication of Ground Water Publishing Co.
“Reverse Rotary Water Well Drilling Using the Air-Assisted Method”, Water Well Journal, September, 1994. Vol. 48, No. 9. A publication of Ground Water Publishing Co.
“Hydraulic Swedging to Repair Wells Spells Success for One Contractor”, Water Well Journal, October, 1994. Vol. 48, No. 10. A publication of Ground Water Publishing Co.
“Monitoring Well Security”, Water Well Journal, November, 1994. Vol. 48., No. 11, A publication of Ground Water Publishing Co.
“What You Don’t Find Isn’t There, Or Is It? Or The absence of Proof is not Proof of Absence”. Ground Water Monitoring Review, Winter, 1994. A publication of Ground Water Publishing Co.
“Sand and Wells – Not a Good Combination”, Water Well Journal, July, 1994. Vol. 48, No. 7. A publication of Ground Water Publishing Co.
“Establishing New Ground Rules Between Consultants and Contractors”, a workshop presented at the Eighth National Outdoor Action Conference, Minneapolis, MN., May,1994. “Conservation de Agua Y Energia,” Seminario Y Taller, A four day Symposium in San Luis Potosi, Mexico, Presentations on Water Well Design and Construction Methods, Water Well Maintenance and Rehabilitation, Cascading Water a Threat to Wells, and How Down Hole TV Logging Aid in Well & Pump Repairs. Noviembre, 1993. “Contracts and Specifications, Bidding Drilling Specifications and Contracts”, A workshop at the 7th. National Outdoor Action Conference, Las Vegas, NV. May, 1993. Annual convention of the National Ground Water Association. “Contracts and Specifications, How to Protect Your Drilling Company”, Water Well Journal, May, 1994. Vol. 48, No. 5. A publication of Ground Water Publishing Co.
“Well Maintenance and Rehabilitation, an Overview”, Water Well Journal, February, 1993, Vol. 47. No. 2. A publication of Ground Water Publishing Co.
“How Downhole TV Cameras Aid Well and Pump Repair”. Water Well Journal, March 1992, Vol. 46. No. 4, A publication of the Ground Water Publishing Co.
“Gus Pech Mfg. Co.”, Water Well Journal, January 1992, Vol. 46, No 1. A publication of Ground Water Publishing Co.
“Want to Get a Handle on Your Pipe?” Water Well Journal, December 1991, Vol. 45, No 12. A publication of Ground Water Publishing Co.
“Darrel Plummer, A Driller’s Kind of Regulator” Water Well Journal, November 1991, Vol. 45, No 11. A publication of Ground Water Publishing Co.
“Staying Successful in a Mature Industry” Water Well Journal, September 1991, Vol. 45, No 9. A publication of Ground Water Publishing Co.
“New Rigs on Horizon” Water Well Journal, August 1991, Vol. 45, No 8. A publication of Ground Water Publishing Co.
“Barber Industries Ltd.” Water Well Journal, August 1991, Vol. 45, No 8. A publication of Ground Water Publishing Co.
“Water Well vs. Monitoring Well Casing and Screen” Water Well Journal, July 1991, Vol. 45, No 7. A publication of Ground Water Publishing Co.
“Roscoe Moss Talks About Casing and Screen” Water Well Journal, July 1991, Vol. 45, No 7. A publication of Ground Water Publishing Co.
“Bill Johnson Equipment Co.” Water Well Journal, June 1991, Vol. 45, No 6. A publication of Ground Water Publishing Co.
“Drilling Supply & Manufacturing” Water Well Journal, June 1991, Vol. 45, No 6. A publication of Ground Water Publishing Co.
“Casing Advancement Methods for Drilling Monitoring Wells” Water Well Journal, May 1991, Vol. 45, No 5. A publication of Ground Water Publishing Co.
“Weber Environmental Makes the Grade” Water Well Journal, May 1991, Vol. 45, No 5. A publication of Ground Water Publishing Co.
“Who’s Afraid of the CLD Test?” Water Well Journal, April, 1991, Vol. 45, No 4. A publication of Ground Water Publishing Co.
“Drug Abuse in the Haz-Mat Industry: How Bad Is It?” Water Well Journal, May 1991, Vol. 45, No 5. A publication of Ground Water Publishing Co.
“New Pump Motor Grounding Procedures” Water Well Journal, March 1991, Vol. 45, No 3. A publication of Ground Water Publishing Co.
“The Tanks Are Coming” Water Well Journal, March 1991, Vol. 45, No 3. A publication of Ground Water Publishing Co.
“Partners in Liability” Ground Water Monitoring Review” Spring1991, A publication of Ground Water Publishing Co.
“Are Water Treatment System Sales for You?” Water Well Journal, February 1991, Vol. 45, No2. A publication of Ground Water Publishing Co.
“The Howard Smith Screen Co.” Water Well Journal, January, 1991, Vol. 45. No. 1, a publication of the Ground Water Publishing Co.
“Something New Under the Sun: A new Drill Rig” Water Well Journal, December 1990, Vol. 44. No.12, a publication of the Ground Water Publishing Co.
“Service Work at Reclamation Sites” Water Well Journal, June 1990, Vol. 44. No.6, a publication of the Ground Water Publishing Co.
“Cascading Water: A threat to Ground Water Quality”. Water Well Journal, April, 1990, Vol. 44. No. 4, a publication of the Ground Water Publishing Co.